Huronia Chapter - Ontario Archaeological Society: Who Knows Where Toanche Is? 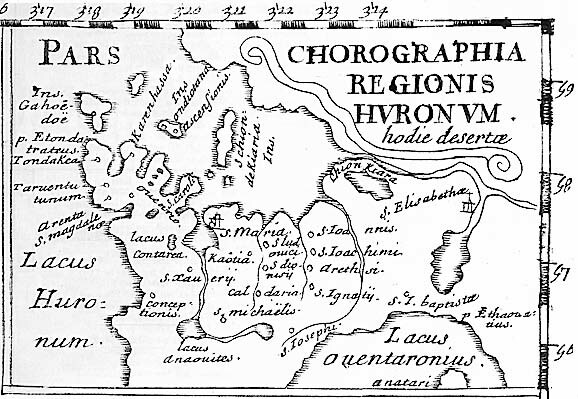 In searching my database I have come across a number of references indicating the speculated location of the Huron/Wendat village of Toanche and or the landing place associated with it and hence the landing place of Champlain in 1615. A E Jones # 28 & 66 (Old Huronia 1908)- lot A con 16 Tiny Township -Otouacha or Toanche landing. A E Jones # 53 & 65 (Old Huronia 1908)- lot 1 con 17 Tiny Township -Toanche 1 - St Nicolas (see footnote AARO 1920 pg 46) - For reference to St. Nicolas see Sagard re 1623 visit. A E Jones # 60 & 67 (Old Huronia 1908)- lot 3 con 19 Tiny Township -Teandeouiata or Toanche ll. Gary Warrick (1990) - N 1/2 lot 8 con 19 Tiny Township (Gignac Lake) -Toanche/Otouacha. Gary Warrick (1990) - S 1/2 lot 2 con 19 Tiny Township (Second Lake) - Toanche 1623. A F Hunter (xxxx) - E 1/2 lot 19 con 20 Tiny Township (Cedar Point) - possible Toanche. C Heidenreich (1968) - N Pt lot 4 con 20 Tiny Township (Gwynne site) - see map. In my opinion these are the sites that require further investigation in our upcoming workshop. If anyone has additional sites that should be added to this list whether researched or speculated please comment with your rational. Charles Gerrard is quite credible and Jones's work, while it should not be ignored, is suspect based on his bias and the amount of work he actually did. As to Jones's speculation re the various locations for Toanche, they are the least documented of all the possible sites mentioned.